Non-stick cooking spray is a spray form of different types of oils that is applied to frying pans or baking pans to prevent food from sticking. It has little or no nutritional value, but gives people who want to reduce their fat intake an alternative to other fats when prepping pans for baking. These days, there is a variety of flavored-oil and olive oil sprays. The Original Pam spray is made with canola oil. One difference in the store brand I am currently using versus Pam is that Pam contains grain alcohol, which dilutes the oil so that I would think you would have to use more of the Pam. Compared side-by-side on the shelf, the store brand, of course, is lower in price. One thing that bothers me about these products is that they are in areosol cans, and the ingredient lists for both show that they contain a propellant, but they do not say what the propellants are. Read warnings on the cans thoroughly before use. Make sure you use in a ventilated area. Non-stick cooking spray tends to be in metal spray cans that resemble cans of spray paint. Choosing: Buy cheap, its all the same stuff. Buying: Purchase this product at any grocery store or local convenience store. 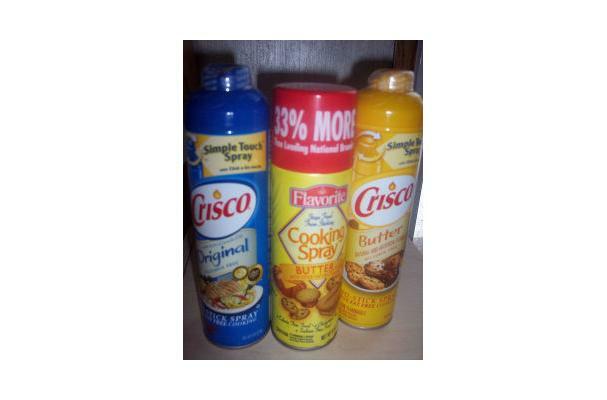 Non stick cooking spray is typically used to coat baking dishes before usage. It prevents sticky substances, such as bread dough from sticking to a baking dish cooking. It can also be used instead of butter/oil when cooking pancakes, crepes or french toast. It is also a great spray to use on your BBQ grill. Hold can about 18" above grill and fire. The spray will ignite for added fun. Cleaning: Sometimes grease will build up around the nozzle. Take a warm paper towel and brush off any excess moisture from around the nozzle. They can also be used to saute foods without adding fat and calories. Also lightly spray the tops of foods when baking to help make them crispy.